1940’s Armstrong Cork Company later became Champion Paper Company and in 2000 became International Paper Company. The lands were surveyed and shown in the ACC and the BDE surveys. In July of 2002 International Paper sells 3100 acres of land to Mr. Lanier J. Edwards. Lanier J. Edwards has this land for about five months and then sells to Mr. Jay Odom. Mr. Edwards purchased a “conditional title” and we assert that he can not legally sell what he does not legally own. Nor should he be able to legally abridge the rights acquired by third parties with the stroke of his pen. The deed Edwards conveys states: All covenants, conditions, restrictions, and easements of record, if any, which may now affect the aforesaid property, and which are not hereby re-imposed. Grantor covenants that the premises are free from all encumbrances made by grantor, and grantor does hereby bind grantor and grantor’s heirs, successors, and assigns to warrant and forever defend the title to the property to the grantee above named and grantee’s heir’s, successors and assigns, against every person lawfully claiming the property, or any part thereof, by, though, or under the grantor, but not otherwise. Mr. Odom (grantee) now has [legal or not] a title that has been laundered clean on it’s face. Having paid Doc Stamps, the title is submitted to the Walton County Assessor’s Office for processing. There is no Walton County Surveyors Office to confirm that the legal descriptions fit the TRS Grid, however they are plotted and added to the web site and the public records are altered to reflect the new owner. This parcel and others been plotted for years in Walton County, assigned Parcel ID numbers, assessed for taxes that have been paid. Mr. Odom proceeds with a “clear” title to involve the City of Freeport, Walton County, and the Circuit Court in establishing the Hammock Bay Community Development District under FS 190. Odom was able to acquire a 35 Million Dollar Public Money Infrastructure “loan” with their help.Developer Jay Odom addresses a Freeport City Council meeting about the idea of the annexation of “Hammock Bay” into the City of Freeport. He proposes a City Park within the boundaries of the Hammock Bay community. When you review this survey you will find that you can not find our property on it, any reference to it, or any of the multiple forms and locations of monumentation in the area. . 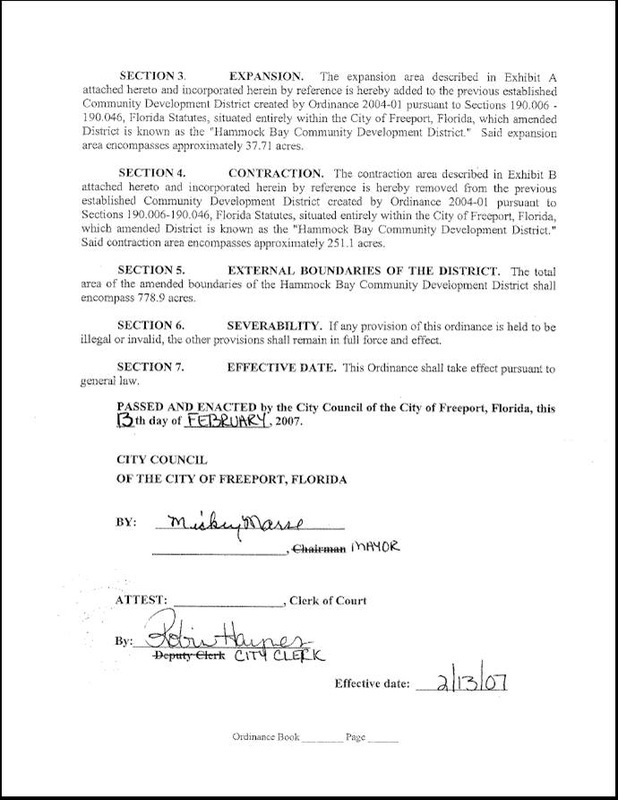 Above images from the records of the City of Freeport - Note Section 4 where 251.1 acres are "contracted" from the original land mass involved with the $35 million infrastructure Community District Development Bond issued for development. 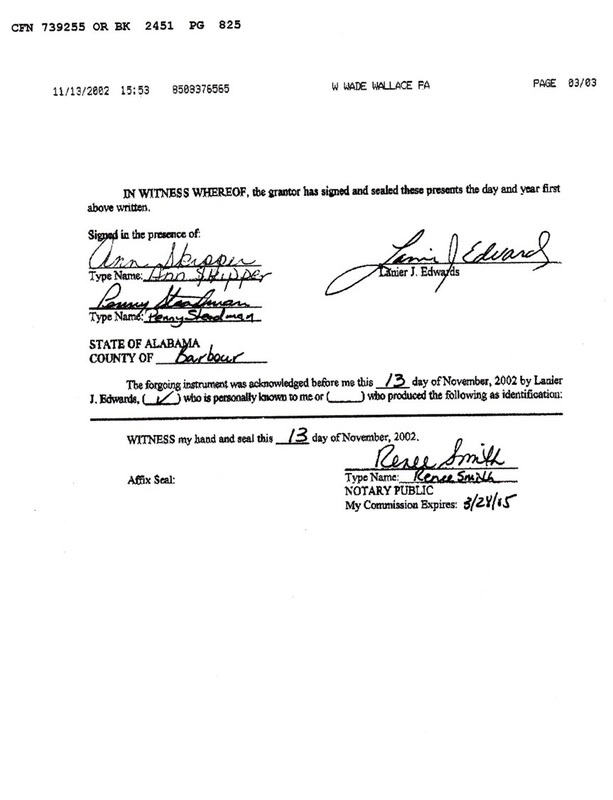 This document clearly has not been filed with the public records of Walton county, by the omission of listing an ordinance book or page number. 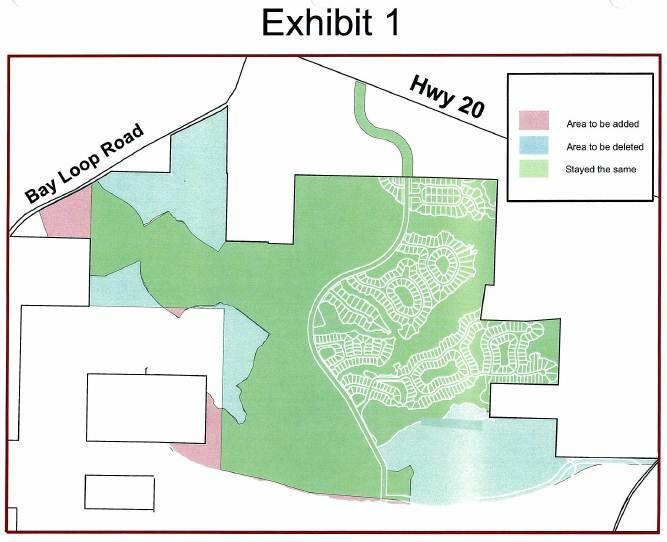 This map was submitted with the petition prepared by Mr. Brian Crumbaker of the Law Firm Hopping Green and Sams in Tallahassee, Florida on February 1, 2007. There is some ambiguity in the lower right hand (south east) corner. An existing road is shown on the area to be deleted from the CDD original description of land mass. This area was eventually deleted from the original CDD description after the road, sewer, and water system was built with the CDD funds. This area is currently owned by a company owned by Jay Odom, containing improvements built with public infrastructure money (taxpayer dollars).